Mark Cavendish is looking forward to his childhood dream coming true: to finish Milan-San Remo on the Via Roma. This Sunday, the British sprinter will lead his Etixx-QuickStep team in the one-day Italian spring monument and try for a second Milan-San Remo win after his 2009 victory on his debut in the race. Race organiser RCS Sport has restored the race’s ‘classic’ finish on Via Roma this year for the first time since 2007. 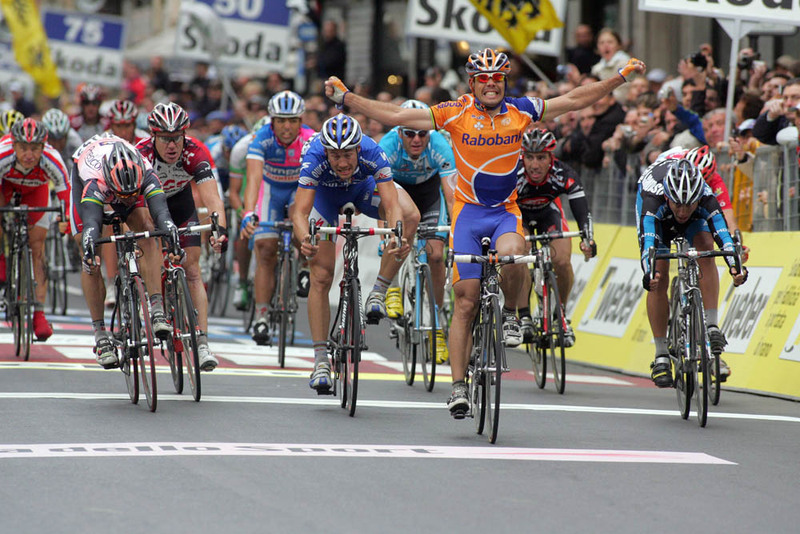 Cavendish first started following the 108-year-old race when Filippo Pozzato won in 2006 and with Oscar Freire’s three wins (2004, 2007 2010). When Cavendish raced for the first time in 2009, he won and at 20 to become the youngest winner since Eddy Merckx. Now, six years later, he will have his first chance to win in the heart of the Ligurian seaside city. In 2008, roadworks forced RCS Sport to take its race a few blocks south of Via Roma to finish on the seaside. The deviation added an extra kilometre from the base of the Poggio’s descent to the finish line. Now, the organiser is able to return to Via Roma where Fausto Coppi first won in 1949 and Eddy Merckx scored his seven Milan-San Remo titles. With early season victories in Argentina, Dubai, Spain and in Belgium’s Kuurne-Brussels-Kuurne, Cavendish’s chances of winning Milan-San Remo appeared higher. However, he suffered a setback when he and team-mate Mark Renshaw travelled to South Africa to participate in a sponsor’s event. He picked up a virus, had diarrhoea and began the Tirreno-Adriatico without his usual kick. He had two opportunities to sprint in Tirreno-Adriatico, but missed out both times: his chain came off in Cascina and he lost contact with the main group driven by rival team Tinkoff-Saxo in Porto Sant’Elpidio. Yesterday in Sant’Elpidio, he abandoned early rather than to complete another circuit under the rain. Instead of racing today’s final time trial stage, he trained with three of his team-mates. “There’s no point in doing kilometres in the rain, it’s better to go training today. If I was in contention, I wouldn’t have pulled out,” Cavendish said. “I really don’t know [my condition after the virus]. In Tirreno-Adriatico, you are under the weather. This year wasn’t a race you could ride into, it got harder and harder. When Cavendish was growing up on the Isle of Man, the nearly 300-kilometre long Milan-San Remo classic became part of Cavendish’s vocabulary along with Paris-Roubaix and the Tour of Flanders. He explained he could not remember the first time he heard of the race, but is able to rattle off every winner in recent years. Out of the five, it is his monument.